Coming another biggie movie from Malayalam. Baahubali mania India made other industries are make something big. Pulimurugan shows malayalam film industry big dreams of heavy budget and money making movies. Pulimurugan was made of Rs 25 Cr and it collected over Rs. 152 Cr from all over the world on its theatrical run till date. Now Pulimurugan is re-releasing in Telugu on May 4 and its 3D version is coming on May 19 in Tamil , Malayalam and Telugu version. Beyond that Malayalam Industries coming with a list of huge films like Baahubali and Pulimurugan. As of now there are 3 biggie project announced. Young Super star Prithviraj and “Ennu ninte Moidheen” fame R.S.Vimal announced a historical movie “KARNAN” with a budget of Rs. 200 Cr. 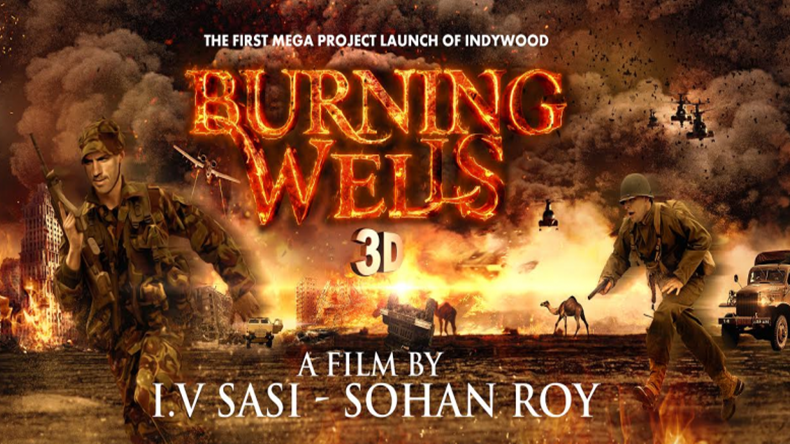 Hollywood director Sohan Roy and Malayalam Director IV Sasi is going to portrait Kuwait War in big screen, named “Burning Wells” with a wooping budget of Rs. 170 Cr, the movies making in Malayalam, Tamil, Hindi, Arabic and dubbing into 30 International languages. And third biggie is none other than the biggie surprise to Indian Film industry “The Mahabharata”, which will be made at a budget of Rs 1000 crores.